Trapping: The best way to get rid of armadillos in any given area is to trap and remove them. I place cage traps in the appropriate manner in the appropriate places, and I catch the armadillos humanely, then relocate them away from the area. Exclusion: When possible, why not just block the armadillos out of the property? For example, if they're going under a shed, porch, or pool deck, I can install steel screen around the perimeter to keep them out. Or a fence around the property - I can install steel screen into the ground at the bottom of the fence, and this keeps the armadillos out. Repellents: Sorry to get you excited, but there's really no such thing. Go ahead and try the classics: moth balls, ammonia (actually, these aren't good for the environment) or coyote urine. They won't affect armadillos in the slightest. Your best bet actually, is probably to hire an experienced armadillo trapper for your dillo removal needs. Armadillo Removal Tips - Dealing with an armadillo problem can be a serious issue for many people, particularly for gardeners who can become massively frustrated at the damage caused by these animals as they dig looking for insects. 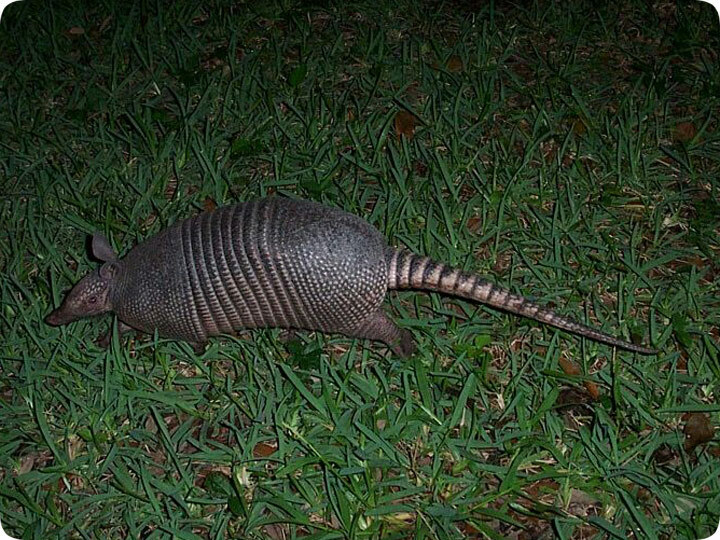 On the whole keeping the armadillos out is often the easiest solution, and a good fence that is embedded at least six inches under the surface will be very difficult for an armadillo to get through. Alternatively, some people will have success by reducing the attractiveness of a garden to armadillos, and providing minimal cover and ensuring no garbage is left out can help in this instance. In some cases there is no choice but to actually deal with the armadillo itself, and trapping and removal is often the best solution in this instance. A cage trap that can house a large domestic cat is usually the best option to catch an armadillo, and many people have success by placing earthworms in the trap as bait. The best way to do this is to place the worms in a stocking so that they remain in the trap. Other people have had success using fruit as bait, but it isn?t one of the natural foods eaten by armadillos and can attract other animals.